Honestly, I'm having a hard time to think of a topic on what to post everyday, so instead I come up to interviewing the authors, who I worked with and helped me in this blog anniversary bash! I want other readers to know who are these authors, and it's fun to get to know them I feel closer (even if they're oceans away from me). And for today, I want to thank Jack Chaucer author of Streaks of Blue for answering my questions. By the way if you haven't read his book, better try it now. It's good! Looking for a review? It's HERE. 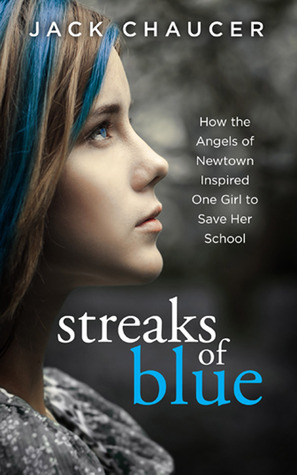 I've written four novels, the latest of which is "Streaks of Blue," which is meant to inspire people to help prevent the next Newtown, the next Columbine. A couple of books I read as a kid that I really remember are "The Adventures of Tom Sawyer" by Mark Twain and "Uncle Tom's Cabin" by Harriet Beecher Stowe. Well, mostly I'm trying to be a good husband to my wife and father to my 2-year-old twins. That's the most important thing. The hardest part was tackling such a dark subject and trying to keep the tone right because it had to be treated with such sensitivity. Nothing. I'm about to be promoted at my real job -- newspaper editor -- so my time will be very limited going forward. My novel career is going on hiatus for a while. That's a great question. I'm really not sure who should play Nikki. Do you have any suggestions? I'd be intrigued to see who you come up with. I would like to write a trilogy. That's my next goal as a novelist, but I'm not sure when that will happen. "Streaks of Blue" has gotten a few nasty reviews, mostly from people who didn't finish the book. I'm not surprised. It's not an easy subject to read about, but most of the readers who have stuck with it seem to get the hopeful message and think the ending is amazing. Bad reviews come with the territory. I learn from some of them, but I do think there are certain reviewers out there who churn through book after book and don't come into the next one with an open mind. They compare this to that, or they expect this and that, and they miss out on half the story or message. I applaud reviewers who may struggle with part of the book, but they keep reading and are pleasantly surprised or emotionally affected in a positive way by the end. I want to say thank you to all of my readers and they should know that my heart is in the right place with "Streaks of Blue." It's not meant to exploit a tragedy. It's meant to prevent the next one. I have kids. I decided to try to write something meaningful before my kid or someone else's kid becomes the next victim of school violence in this dangerous world. Will it make a difference? It already has based on some of the great responses I've received. And that's the message of "Streaks of Blue" -- one person can make a difference. I'm doing it by writing an inspiring novel. Nikki did it in the story by getting involved and reaching out to a kid who was going down a very bad path. She is a brave hero. And this world needs more of them. * wait * Before I proceed to the giveaway I wanna answer Jack Chaucer's number six, I can suggest Emma Watson or Lily Collins. They're great.